Estrogen therapy can relieve symptoms of menopause in some women, but it also slightly increases the risk of ovarian cancer. New research from Dr. Barbara Vanderhyden’s team provides the first possible molecular explanation for this link. Using cells derived from the surface of the ovary, they found that prolonged estrogen treatment increases the level of a molecule called microRNA-378. This molecule releases the “brakes” that normally control cell growth by changing the expression of a gene called Dab2. The end result is an increased risk of ovarian cancer. This research also suggests a mechanism by which natural estrogen changes during ovulation could play a role in the start of ovarian cancer. Future research could lead to new approaches for prevention and treatment. 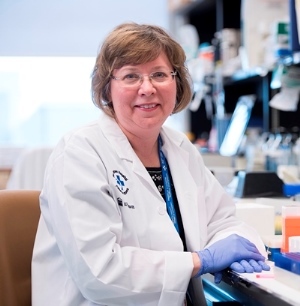 Funding: This research was possible because of generous donations to The Ottawa Hospital for Cancer Research. This study was also supported by the Canadian Institutes of Health Research and the Government of Ontario (Ontario Graduate Scholarship and Queen Elizabeth II Graduate Scholarships in Science and Technology).